We take pride in our good reputation based on our excellent customer care and standard of treatments. We offer an extensive range of expert treatments from electrolysis hair removal to Lycon Waxing techniques. We are proud to use a new waxing system, Lycon precision wax. Using only the finest resins, natural ingredients along with aromatherapy oils, Lycon delivers superior performance, removing stubborn hair as short as 1mm. A Lycon wax is 50% less painful than other wax making it the perfect choice for all of our intimate waxing using only the Lycon hot wax. Please note that Lycon hot wax is used in all of our intimate waxing. 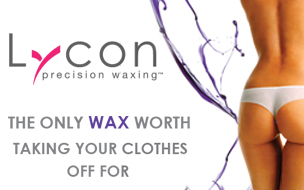 Lycon wax is ideal for coarse, stubborn hairs and 50% less painful than other wax available. The ideal choice for coarser hair in more sensitive areas. Discover the art of Manscaping with our Lycon male waxing treatments. Most importantly relax, our therapists are highly skilled and professional. We will ensure you feel as comfortable as possible throughout your treatment with us. Lift Beauty Clinic has specialised in electrolysis for 30 years and are widely recognised as the specialists within Suffolk. Electrolysis is for the permanent removal of facial and body hair using Sterex disposable needles, utilising short wave diathermy or ultra-blend systems, according to the needs of your condition, ensuring maximum results with minimum discomfort. Electrolysis is suitable for both female and male clients and any skin type. We are the specialists in Ipswich for electrolysis and advanced electrolysis. Please note that failure to cancel your appointment with less than 24 hours notice will result in a 50% cancellation fee being charged. Failure to attend an appointment booked on-line will result in a 100% cancellation charge. If you do not attend two consecutive appointments you will no longer be able to book without paying the full amount of the appointment upfront.